Theresa May has reportedly warned her Cabinet that they must agree to this position, or else they’ll be disciplined. 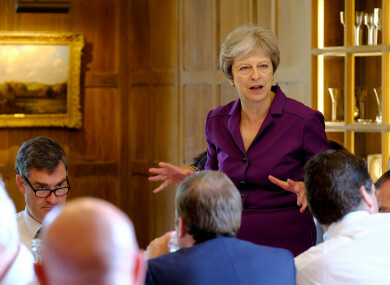 Prime Minister Theresa May speaks during a cabinet meeting at Chequers. BRITISH PRIME MINISTER Theresa May has said that her cabinet have agreed a “collective position” on Brexit negotiations with the EU. It comes after a day-long private meeting at Chequers, the country house of the UK Prime Minister. The phones of British Ministers were handed in before the meeting, to ensure May’s Cabinet didn’t leak any information discussed at the talks. She said that the British cabinet has agreed to a “UK-EU free trade area” for goods. “Today in detailed discussions, the Cabinet has agreed our collective position for the future of our negotiations with the EU,” she said in a statement. Next week we will be publishing a white paper which will set out more details of how we will be taking back control of our money, laws and borders. Now we must all move at pace to negotiate our proposal with the EU. In a video shared on the UK Prime Minister’s Twitter page, the 12 key principles the UK would approach negotiations with were outlined. But the key principles are quite vague. They include “ending free movement”, “no more sending vasts sums of money each year to the EU”, and “a new business friendly customs model with freedom to strike new trade deals around the world”. Interestingly enough in relation to the Irish border problem, the UK government is proposing a new “UK-EU free trade area with a common rulebook for industrial goods and agricultural products”. This would require the UK and EU to agree on what regulations it applies to goods – but the EU is unlikely to lower its standard of regulation of goods in order to create a customs arrangement with the UK post-Brexit. It also reaffirmed its commitment to “no hard border between Northern Ireland and Ireland or between Northern Ireland and Great Britain”. May’s cabinet also agreed to leave the Common Agricultural Policy and Common Fisheries Policy, and to leave the jurisdiction of the European Courts of Justice. Sam Coates of the Times of London tweeted out what is claimed to be an extract of a letter written by Theresa May to Tory MPs. The letter instructs Cabinet members to agree with the proposal outlined, hinting that there they will be out of a job if they don’t comply. “Brexit did not mean keeping the 90% of our economy that does not export to the EU trapped by their laws. No resignations means that the so-called Brexiteers in cabinet don’t have a principle between them, career politicians all. Just nine months remain until the UK is due to exit the bloc in March of next year. Despite this, a large number of issues remain unsettled in negotiations between both sides. The EU and the UK are divided on a large number of issue, including customs and trade negotiations, the free movement of EU citizens and the issue of the Irish border. Meanwhile, large divisions exist within May’s own Conservatives party and cabinet over what sort of approach the UK should take to Brexit. EU leaders have warned Britain that they must present detailed plans soon or risk crashing out without a trade deal. The Cabinet is split between pro-EU and anti-EU ministers. For example, Treasury Secretary Philip Hammond wants to retain close economic ties with the EU and its market of 500 million people. Meanwhile, and pro-Brexit lawmakers like Foreign Secretary Boris Johnson want a clean break so Britain can strike new trade deals around the world. A powerful group of pro-Brexit Conservatives have also warned May she could be toppled by her own party if she opts for a compromise Brexit. The issue of the border between Ireland and Northern Ireland and the UK remains one of the main issues facing the British government. Last week while in Brussels Taoiseach Leo Varadkar said that time was running out in relation to an agreement on Britain’s withdrawal being reached. “Time is running out for the Withdrawal Agreement to be concluded satisfactorily by the October European Council,” he said. Britain has promised to maintain an invisible border, free of customs posts and other infrastructure between the Republic and the North. The proposal May presented to Cabinet today - dubbed a “facilitated customs arrangement” — calls for the UK to use technology at its borders to determine whether goods are bound for Britain or the EU, and charge the appropriate tariffs. It would also commit Britain to keeping its regulations closely aligned to those of the EU. That would not go down well with pro-Brexit ministers who say it would limit Britain’s ability to strike its trade deals with non-EU countries, so it is unclear if it will be accepted. There is also a big question mark over whether the EU would accept any such proposals, with officials warning that Britain can’t ”cherry pick” benefits of membership without accepting the responsibilities that come with being in the bloc, including allowing free movement of EU citizens to the UK. Email “After a day-long private meeting, Theresa May's cabinet agrees to a 12-point Brexit position”. Feedback on “After a day-long private meeting, Theresa May's cabinet agrees to a 12-point Brexit position”.